When the whole “social networking” thing first started to become popular in the summer of 2004, I was one of the first persons in my class to sign up for MySpace. At that time, it was the only “must join” social network because Facebook was only available at select colleges. All of my friends thought I was stupid for signing up for a MySpace account to meet and collect e-friends, but I had an intuition that there was something worthwhile, not to mention efficient, about networking online. Over the next two years, I collected over 500 friends on MySpace despite never seeing the benefit of having so many friends for only “social” reasons. After becoming progressively more frustrated with the useless Myspace comment banter, I deleted my account in December of 2006 and haven’t looked back since. A month later, I started my personal blog, NateWhitehill.com. Social networking for me evolved from MySpace to blogging; one of the best decisions I have ever made was to migrate my social networking to my blog. 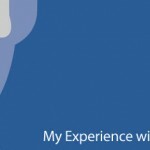 It didn’t take long for me to see the benefits from networking through my blog compared to networking through MySpace. Instead of people seeking me out for purely social reasons (e.g., an ex-girlfriend), people were seeking me out for professional reasons. This eventually led to a realization that I could market my products and services exclusively through the Internet and thus save thousands of dollars of marketing costs. Given where I am at in my life – professional development is much more important to me than socializing, partying, or dating. In other words, I found my blog to be much more beneficial than MySpace as a professional networking tool, even more so than LinkedIn, which I have also used, but not quite seen the benefit from. Ever since Facebook opened their registration to everyone, my sister and many others have encouraged me to sign up. As a result of my useless Myspace experience, I never saw value in signing up for another social service that provided little-to-no professional benefit. To get to the point of this story, I never thought I would say this, but I finally signed up for Facebook and have to say that I have been VERY impressed. Why did I sign up? Our team is in the beginning stages of developing a web application, and what better place to study what works and what doesn’t than on one of the most widely used web apps on the net – Facebook. Not to mention, but with 50 million users and a new platform for delivering highly-targeted Ads, Facebook looks very attractive from a marketing perspective. Facebook really took off in 2004 when Harvard freshman Mark Zuckerberg dropped out of college in order to develop the application full-time. Within 7 months of launch, Facebook had over one million college students actively using the network. Three years later, over 57 million people are actively using Facebook, including over 200 people from my graduating class! 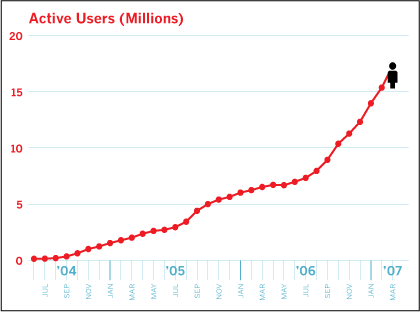 Facebook has been averaging over 250,000 new registrations per day since January of 2007 and active users are DOUBLING every 6 months! Instantly when you register, it more easily facilitates finding old friends and other people you know. Case in point, within 24 hours of signing up for Facebook (and not even publicly announcing it to anyone), I received over 30 friend requests from people I know. The demographic of Facebook is much more mature than MySpace. According to Facebook’s own statistics, more than half of Facebook users are outside of college. Not only that, but the fastest growing demographic is those 25 years old and older. The applications built into Facebook, such as photo and event sharing, are light years ahead of MySpace. The Facebook Developer Platform provides for an infinite number of marketing and data collection possilibites. With the new Facebook Ads platform, you can reach a niche audience with relevant and highly-targeted ads and optimize your site with onsite analytics. There is less risk of encountering fraudulent users on Facebook compared to MySpace. I am sure this is not news to most of you who use Facebook, but the technologies, networking tools, and web applications built into it are incredibly intuitive and advanced. Facebook’s photo sharing application is the most widely used one on the Web (according to comScore). This puts it ahead of other applications including Flickr and PhotoBucket, which reminds me… PhotoBucket sold earlier this year for $250 million. Probably the coolest thing about Facebook is that it is a platform on which others can build applications. There are currently over 7,000 applications that have been built on Facebook. Applications can do everything from displaying quotes of your friend’s favorite pop artists to allowing you to showcase your recent blog posts on the Facebook profile (like I do). I was so impressed with Facebook that I took time to watch the young Facebook CEO give a 45-minute keynote speech at the f8 Developer Conference. If you want to check out this soon-to-be billionaire give a great speech to over 800 developers, check out this link: f8 Keynote. From a professional and business marketing standpoint, Facebook appears to be much more useful than MySpace. We all know that a huge majority of people using MySpace are high-schoolers, whereas Facebook’s user base consists more of college-aged individuals and adults. Facebook allows one to create special Pages for businesses or brands. I created a Facebook Page for Unique Blog Designs, and instead of accumulating friends, we have fans. 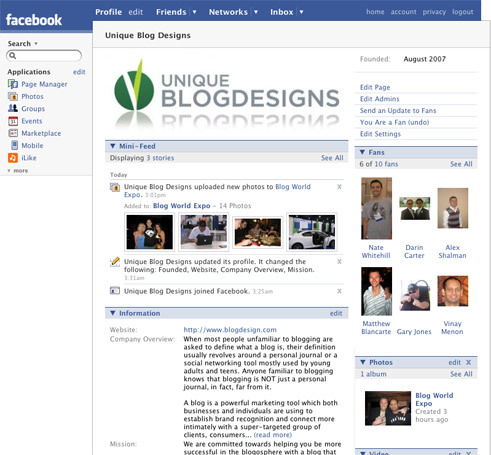 (Click here to become a Facebook fan of Unique Blog Designs.) Our Facebook page seems like it will fit well into our marketing mix as we now have another avenue to communicate with past and future clients. A huge part of what motivated me to get involved in making money online was from other young and successful entrepreneurs. It was November of 2006 when I first became intrigued with Zuckerberg’s success, and it was through researching him that I stumbled upon Digg and eventually John Chow’s blog. It was through John’s blog that I became inspired to start my personal blog…and here I am, 11 months later, involved in my most successful and fulfilling business enterprise to date (UBD). Late last year (2006), Zuckerberg turned down a $1.6 billion buyout offer from Yahoo. Some would say he is stupid, but maybe he is just that much smarter. A month ago (October, 2007), Microsoft purchased a 5% 1.6& equity share in Facebook for $240 million. By this measure, Facebook’s actual value is between $5-10 billion $15 billion, which is almost as much as worth more than MTV! All this for a company that was conceived only three years ago!. Zuckerberg still possesses a roughly 30% share in the company, so when and *IF* Facebook sells, Zuckerberg will very likely be one of the youngest billionaires in history! 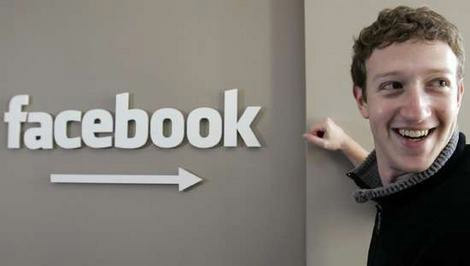 The other option is of course, Facebook going public which will also make Mark a very well-off individual. I suppose that most people would expect that a geek like me would be all over what many people call the coolest web application on the Internet. Honestly, it is surprising even to me that I didn’t sign up for Facebook earlier. Reconnecting with old friends and meeting new ones is done much more easily and professionally through Facebook. Even though Facebook is light years ahead of MySpace as far as technologies, application, networking tools, and professional benefits, in my opinion, Facebook is still dwarfed by the tremendous professional benefit that one can achieve through personal blogging. I will save that comparison for a future article when I have had more time to evaluate Facebook. If you want to be my friend on Facebook, you know what to do. Corrections made: Microsoft purchased a 1.6% equity share in Facebook for $240 million, making Facebook worth approximately $15 billion, which is more than MTV. On paper, Mark Zuckerberg is worth several billion dollars. Being blocked at work I never got chance to use facebook, but I have been reading a lot about facebook applications… Now after your post I think that I am missing a development area… I must signup today! I could not agree more. I get lost in facebook. I get lost in all the other social network blogs to which I have been enrolled by various “well wishers” and I simply have stopped visiting them. I like to visit individual blog sites and comment as should by now be obvious. Having said that, I must also admit that facebook is indubitably the best there is in its genre. Being a UBD fan SHOWS! right!! Welcome to the wonderful world of facebook! I could not agree more. Great post, so true! I totally agree with you Nate. Facebook is a wonderful place for networking and for making money too. Yes, you are right Ads in facebook applications are very profitable and this is what the most of the marketing professionals have agreed on. But as you know not everyone has the ability to build its own facebook application and not everyone has the financial ability to order a facebook application. Therefore, we have to find some other ways to make money on facebook. Most of the facebook users can’t see the big opportunity which is directly in front of them, even when they are webmasters and they know what the a huge traffic facebook has. I’ve always had that a “feeling” about using myspace and facebook for Networking services as well. But never quite figured out the right way to do it. As a result, I haven’t signed up for facebook. But now with all this talk going on about the facebook application. And the way you can market and advertising in a really tight niche. I’m really interested to learn more about. Finally, when you hear that he accepted $240 million for just 5%, you realize how ripped of the MySpace guys were for accepting $750 mil for 100%. ha! That’s just silly-absurd-awesome-amazing-stupid money. Wow. Who on earth could ever turn down a $1.6 billion check? MySpace sold for $580 million in 2005, but many agree it is worth almost $20 billion. Facebook is so not for me, but i do enjoy the social networking that blogs such as this provide. So thanks Nate for making this opportunity for all of us. Haven’t tried Facebook yet, but hear good things about it. I do know that it’s getting ridiculous with MySpace and all the spammers/phishers. Maybe they can learn a little from the direction Facebook is heading. My hairdresser (she’s 24) keeps telling me to get a Facebook account because of the social networking aspect. Never really thought about using Facebook for business purposes. Have you see traffic on UBD coming from Facebook? Just beware of application overload…jeez, you should see my brother’s page. I think he has every application available…takes like 10 minutes to load! Well don’t know much about the professional benefits but facebook is fun to access.Facebook has become a part of our daily routine, It’s been accessed almost everyday to check what messages you have or whose online or who poked you etc…..Facebook has become every man’s need now. Some might be facing problem as in some offices it’s banned…..well there’s a solution someone found out for that. The service is called MoDazzle. Through modazzle you can access facebook & such networks on mobile via sms and email without internet i.e. GPRS or WAP. One can’t stop you from using your mobile now a days, can they? While facebook has very strong social networking benefits, I’ve discovered unlimited business poetential for it as well. traffic from that site to my commercial sites have been tremendous! I am not sure but I was never excited to check out facebook ever. I might not even try to give it a try. I don’t care about facebook, yeah it drives traffic but not much as it could. But one interesting thing in Facebook is my profile page PR is 6. Not everyone loves him, it seems. Thank you for this. I have not used facebook so much. I know it’s is a craze among the college going groups in U.S. There seems to be a lot of potential for maketing products on that platform. Yet to explore it to the fullest. Nice article. It all depends on how they are to monetize their membership. Sure; it they do have impressive numbers, but so far the valuations are based on an unknown, unproven business model. I am not saying that they cannot do it, but it will take some different thinking, and potentially a greater invasion into our privacy that may cause some user backlash. For My Experience in facebook it’s drive good traffic and it’s market place is good for me. This is so unbelieveble i mean i get on Facebook expecting to check out my friends new vacation pics or the latest wall post and end up staying on for hours!!! Face book is the most famous online networking site. It is the best source of the traffic. I think face book is very nice and easy way to drive traffic, One of the interesting things about social networks and other web 2.0-y stuff has always been the opportunity for marketers to see how people actually talk. Facebook has now become a bit overpowering with the amount of applications now offered. Next Next post: Here Comes The Bubble?